This week has been a hectic one at Giant Headquarters! Granted, we’re always pretty busy, but Tuesday and Wednesday we were out enjoying the local offerings! Wednesday we were at the University of Kent, speaking at their Talent for Tomorrow conference – you can find out more about this here. That’s right, we were taking part in the national BIMA Digital Day 2016! What is BIMA Digital Day? The BIMA Digital Day is part of a scheme to teach students about the varied and interesting careers available in digital. We were contacted by some friends of ours over at Yoyo Design who let us know this was going on, and asked us to be a part of it – we were only too happy to say yes! A hop, skip and a jump to a month later, and we were contacted by BIMA to say we had a match! Folkestone Academy welcomed us with open arms, and together we were soon hatching a plan to present to the students and get them engaged in what we think is a pretty awesome line of work. We first got in touch with Folkestone Academy to ask them what kinds of students wanted to get involved, how many, and whether they really knew anything about digital marketing in the first place. From there, we got some volunteer EDIT: we volunteered some folks from Sleeping Giant to get started on their presentations. Once we knew what they expected, it was simple to tailor it to them! We knew we wanted to get the students involved, knew we wanted to teach them as much as we could, and knew we wanted to answer as many questions before they were even asked! 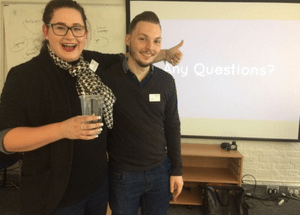 We put together 3 presentations (one for every service we offer), and a Dragon’s Den style task at the end to give us a proposal of how they’d help one of our clients. Once we were prepped and our volunteers had worked out their nervous jitters, we grabbed our laptops, packed our bags, and headed off to the Glassworks to start our day! It was great fun! Sure, the students were reluctant at first, but they got into it soon enough. The lovely Lizzi and Jasmin got them involved in their first tech memory, Greg and Cara enthralled them with cookies (not the delicious kind), and Kristy and Ben showed them around our office by our 360 video! We threw a lot of information at them, and they were only too keen to soak it in. It was a full-on day, but by the end of it, we’d all learned loads, and had a great time doing it. 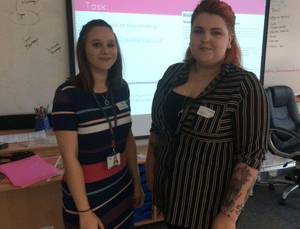 We want to thank Folkestone Academy and the students for the day – we had a fantastic time! Talk to the school – they can give you ideas on what students will be doing it, how best to engage with them, and what they’re looking to gain from the day. Talk to BIMA – if you’re ever in need of a hand with preparing the day – give them a call. Get involved – teaching students about the kinds of careers available to them is so rewarding. They can grow up to be anything, so give them the option to enjoy what you do in life! Sleeping Giant Media do a few presentations to schools every year – if you’d like us to do the same for your school, send us an email!